What do you know? This is my 200th post on the blog! That’s a whole lot of writing, and it’s thanks to all you readers that I keep finding the inspiration to do what I’m doing. So thank you! “Anticipation” was really the perfect title for this episode, as it was all about Ki-ja, the White Dragon, and his dissatisfaction at having divine power and not being able to use it. At least for me, the set-up was strong enough that I felt pretty darn relieved for him by the time he finally saw Yona and the blood of the dragon responded. 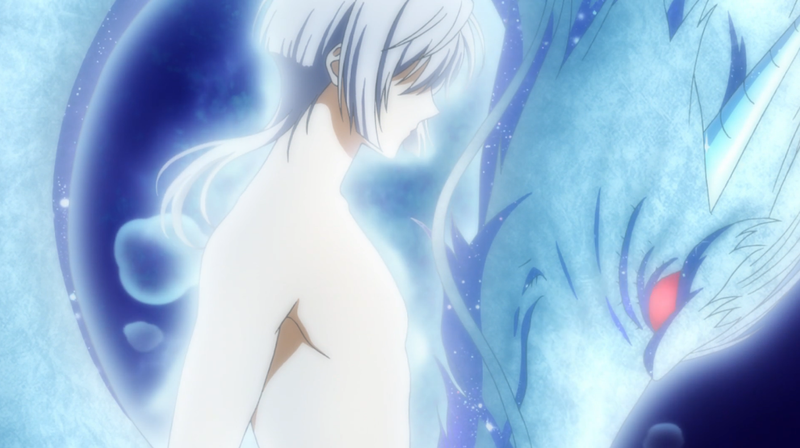 Also nice to see that at least someone is capable of getting under Hak’s skin a little bit. But, overall, it wasn’t a very serious episode—just a lot of pleasant watching. I’m guessing this will be a shorter post because the comedy really did take the lead for most of this episode, which, while amusing to watch, doesn’t really leave me much to write about. LOL. 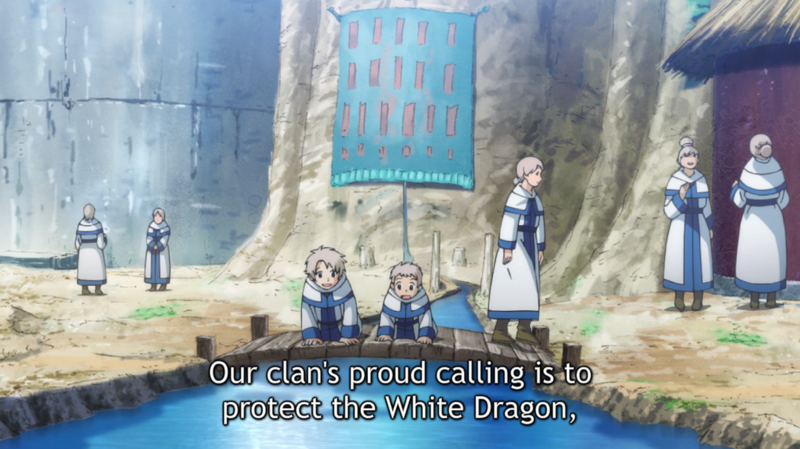 The structure of the White Dragon’s village is really interesting, because it effectively exists for the sole purpose of perpetuating…well, it’s not even a single bloodline so much as it is a single “genetic” trait. It’s an odd cross between religion and social structures and traditions that forms around a single person. Yona’s introduction into their culture, then, resurfaces an odd sort of old-new element. 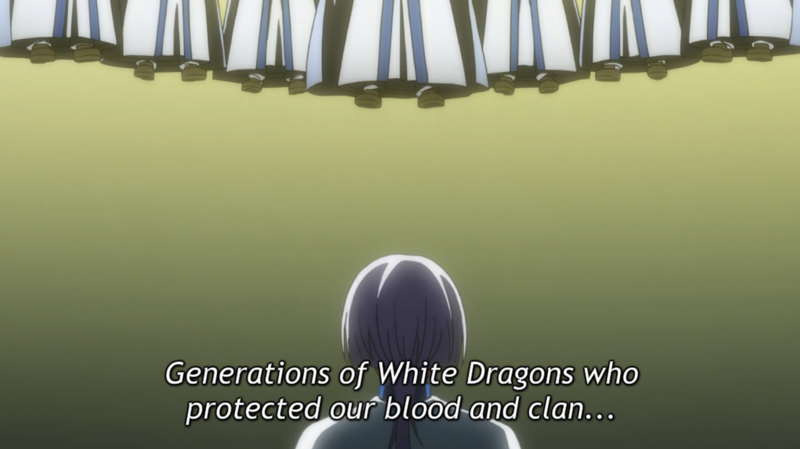 After all, while the White Dragon served Hiryuu, the White Dragon tribe has served only the White Dragon for hundreds of years. So, when Yona as Hiryuu’s reincarnation to appear before, they dig into the depth of their cultural consciousness and react to her based on a long ended myth—and that myth still informs the narrative of how their village functions. 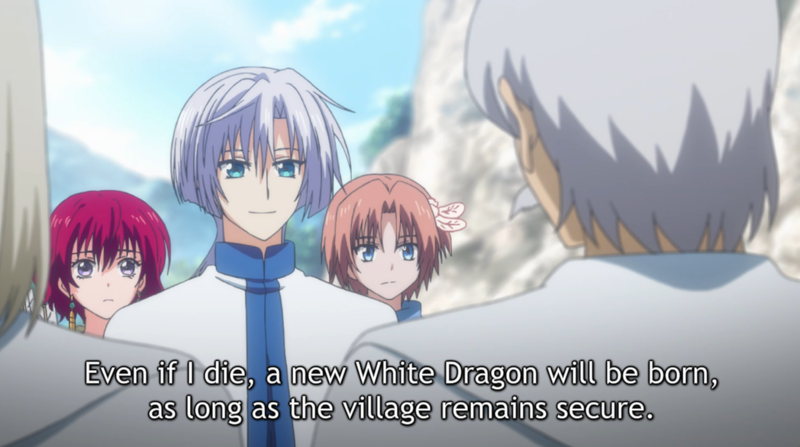 Yona’s very existence effectively begins to recycle the myth, so that, as the Grandma says, they will wait for the White Dragon to return after fulfilling his duty, just as the original did. Ki-ja the person, then, has been somewhat trapped by his role as the White Dragon. As he says, there’s a certain dysfunction in the fact that he is the one with sacred power, yet he is the one the village exists to protect. 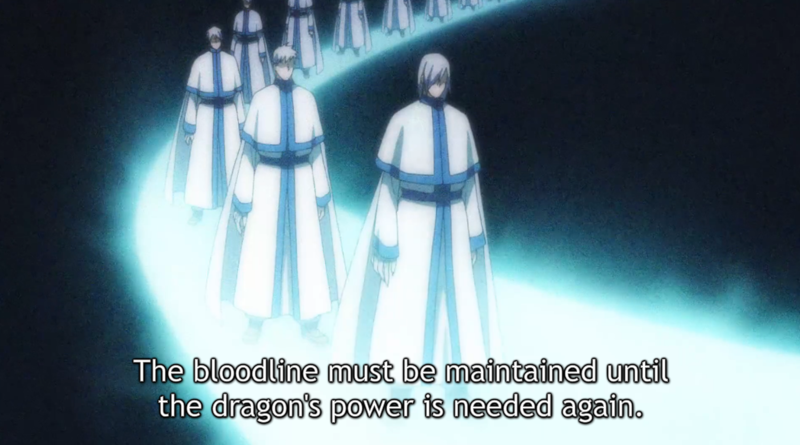 That’s certainly a statement on how the White Dragon’s village views sacred power—it’s something to be used for a specific purpose or, in this case, a specific person. Without the channel for his power, the White Dragon instead becomes something of a cultural artifact, the essential cog that spins the functioning of the entire village. It’s really a fascinating example of cultural objectification—the institutional narrative of the entire village depends on the White Dragon needing to be guarded from the outside world until his master appears. Without regards to Ki-ja as a person, the village uses him as a representation of the essential myths that allow the village to function. 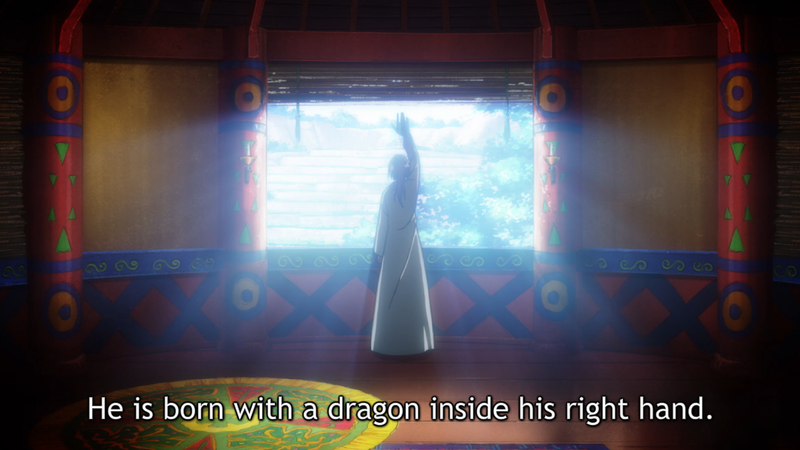 But, Ki-ja the person (not as the White Dragon) is impatient for the day that his turn in the story will come. Like the White Dragons before him, he’s been compelled to remain in the village by the forces of his village’s needs and his culture’s myths. He seeks release from this stage of stasis. Even the little comedy moment of the Grandma harassing him about having no romantic prospects on the horizon (I can relate to that one), and his plea for his master to hurry represents the tension between the village’s expectations for him and his own desires. 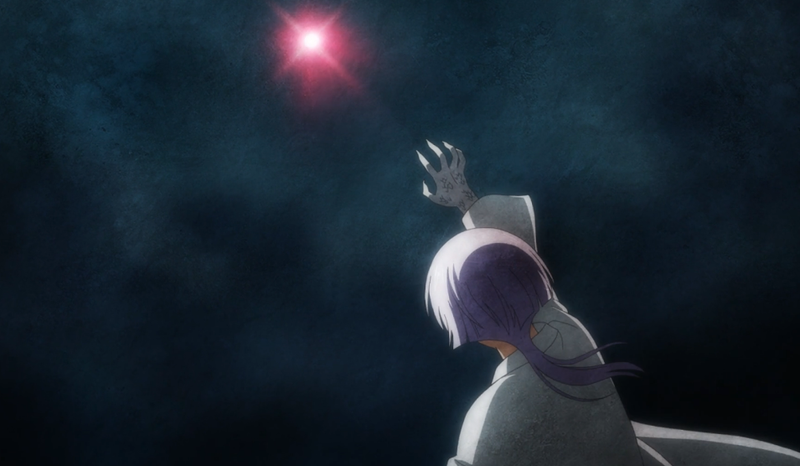 I do really like that the motivation for Ki-ja to leave the house (the decision the leads him to meet Yona) is to protect the village—he is, in a sense, acting on his own desires, not on those of the village, and it is in doing so that he meets his destiny. Fate comes to the ones who seek it, perhaps? Yona’s certainly not totally aware of what she’s doing to the village’s mythic structure, but she seems to at least understand that she’s taking something important away from the village. But for her, it doesn’t matter. She recognizes the possibility that the White Dragon won’t lend them his strength—and she’s prepared to carry on without it. 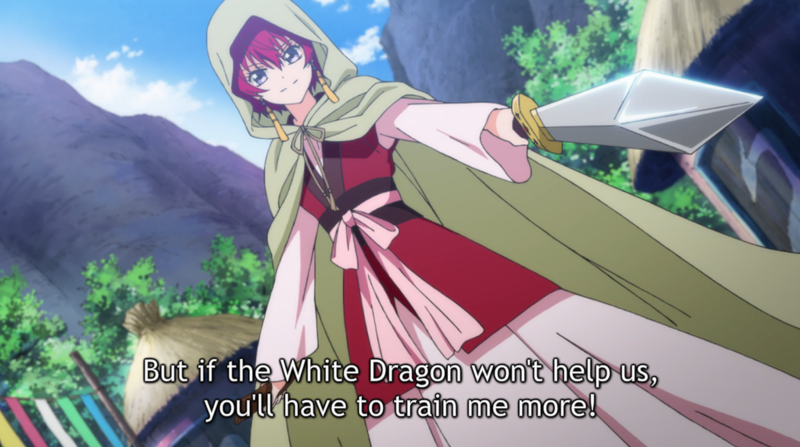 There’s a kind of beautiful irony in Yona preparing to move on without the White Dragon, if necessary, and that being the moment Ki-ja sees her and understands instinctively that she is the one. The actual moment of his revelation is portrayed in brilliant reds and described as “blood running backwards,” which I think represents a core certainty in his realization. 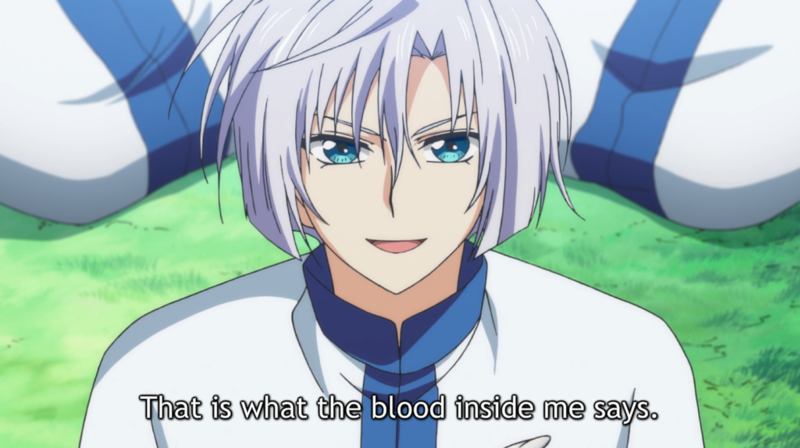 Blood often symbolizes life itself, and so it’s not just Ki-ja’s blood that responds to Yona, but his very life. 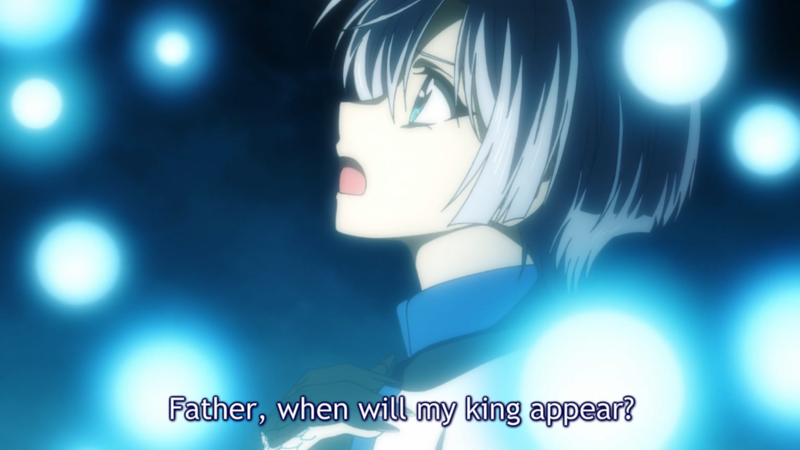 It’s not insignificant that the first thing Ki-ja thinks of as he sees Yona when waking is his father, and the generations of White Dragons that came before him. “I am grateful!” he exclaims, and I think it goes beyond the simple joy of finding his king into the realm of personal, generational, and cultural fulfillment. As the village’s mythic center, Ki-ja has been allowed to see the validation of their existence and way of life and to be the focal point for that divine action. I found it to really be a moving moment. 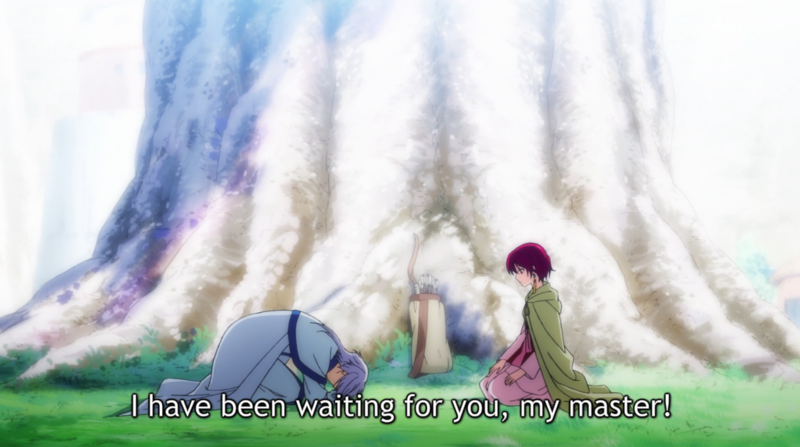 The last thing I really want to talk about is Yona’s small speech to Ki-ja before accepting his power. 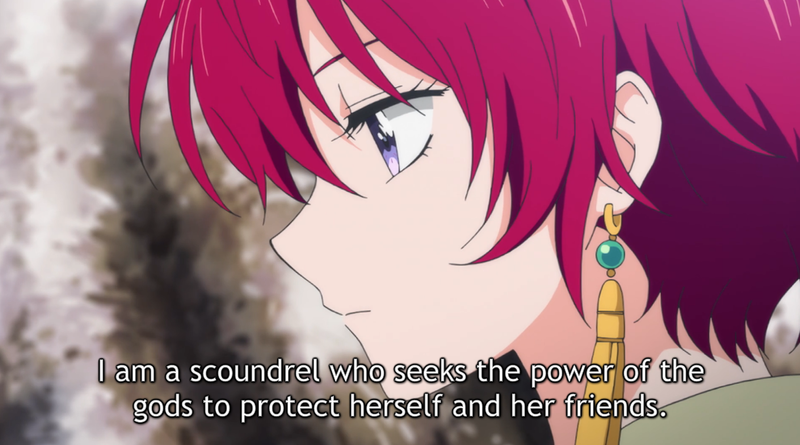 She calls herself a scoundrel, which is the exact word that’s been thrown around multiple times this episode (by the old man who guided them in, by Ki-ja himself stalking to confront the intruders), and confesses the lack of grand and noble aspirations. It’s an important moment for her: firstly, to be honest with the divine creature whose assistance she’s requesting, and secondly, to be honest with herself. We get a quick shot of Hak smirking at her revelation, but I think it’s telling that he doesn’t try to stop her like Yun does. Yona will be the type of person she wants to be, and that means holding no illusions about what her true goals are. 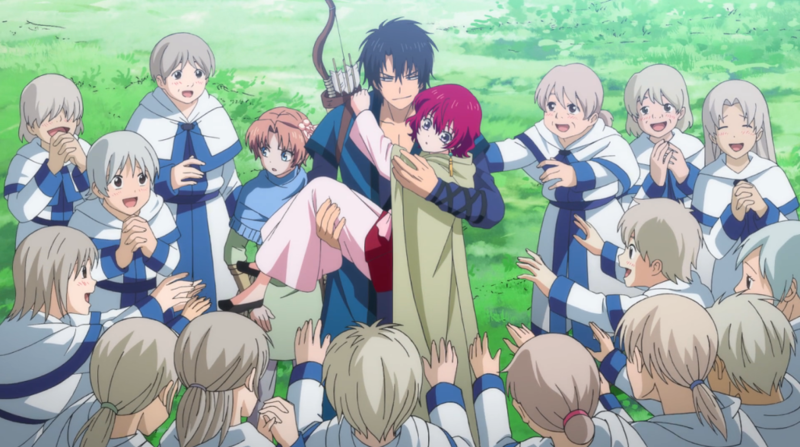 The rest of the episode is more or less just reverse harem-esque macho banter between Hak and Ki-ja, and the themes touched on by Ki-ja’s farewell to the villagers fall in line with the rest of the cultural observations I’ve already made. As far as the actual story goes, I did think the episode was a little slow. Amusing, sure, but I was expecting the introduction of another conflict before the end of the episode and we didn’t get one. In narrative terms, there wasn’t all that much that happened, even with all the interesting exploration that the show did on cultural mythology. Here’s hoping the next episode can put both the thematic depth and narrative execution together next week! I have a feeling may have been out of the village before this. I love everything that this shot implies about him. Oh, yeah, I kind of skipped over that because it didn’t have much to do with anything else I’ve been talking about, but that could very well be an example of him stepping outside of the village’s expectations for him and paying for it. Coupled with the “female assassins” line, yeah, that one shot had so much information that they can come back to later on. I actually really liked this episode – which is a little odd coming from me, because I tend to prefer the more serious material and generally like only small snippets of humour in shows like this one. I guess the humour in this particular episode just really worked for me for some reason. … And I’m not gonna lie – I didn’t mind the eye candy either. 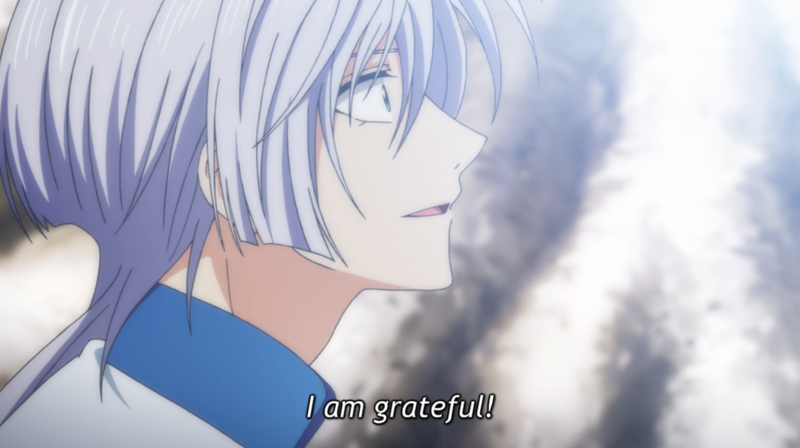 I did think the humor was among some of Yona’s best (like Yona’s silly reaction to Ki-ja calling her “divine” and Hak’s “happy/very happy” moment), which definitely made it a pleasant episode. Well, I won’t comment on Ki-ja’s personality, as I don’t think I’ve seen enough of it to judge whether I like it or not. 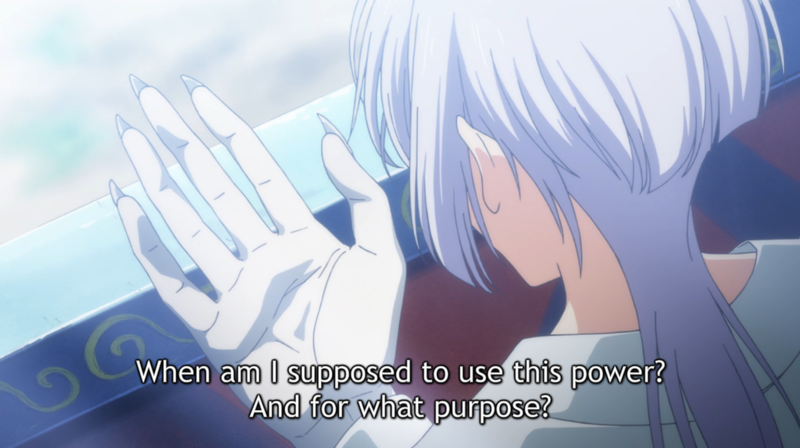 As for his looks, I’m just incredibly biased – I really dig white-haired anime bishounen. A lot of incisive observations here. 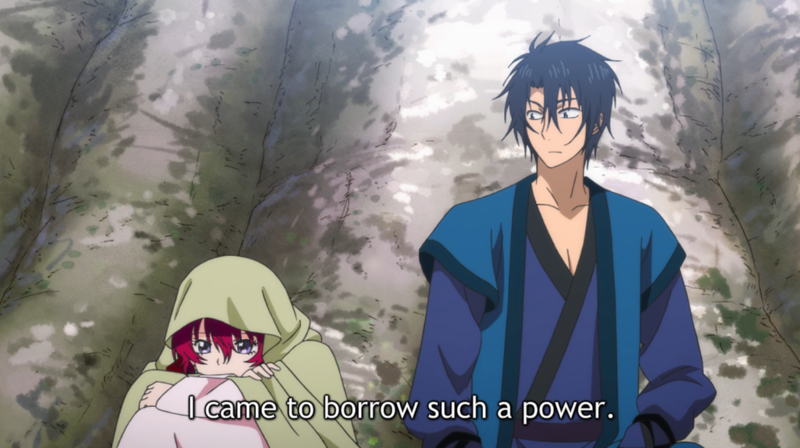 Yes, with Kija, it’s important to remember that Yona’s appearance validates not just his own life experiences up until this point, but his entire village’s way of life, as well as all of the sacrifices made by generations past. The creation myth isn’t just some fairy tale he can walk away from. 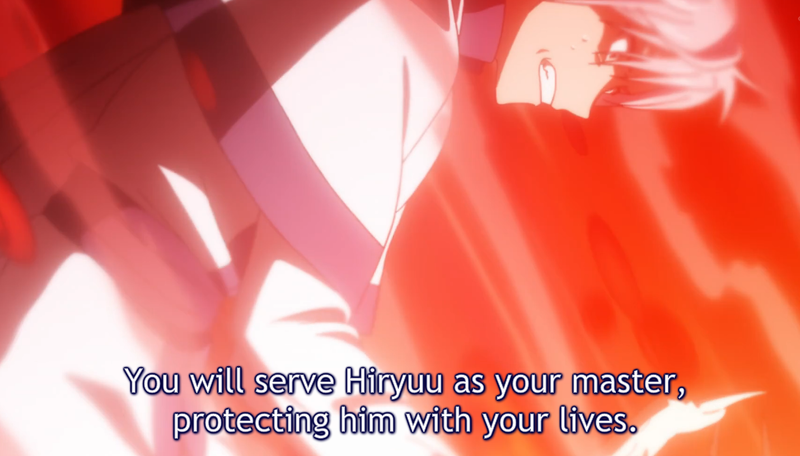 Everyone he has ever known and everyone he has ever heard of has collectively invested far too much in the Hiryuu myth for him to do that.